Samsung has revealed when its long-awaited foldable flagship smartphone will be unveiled. Well, sort of. 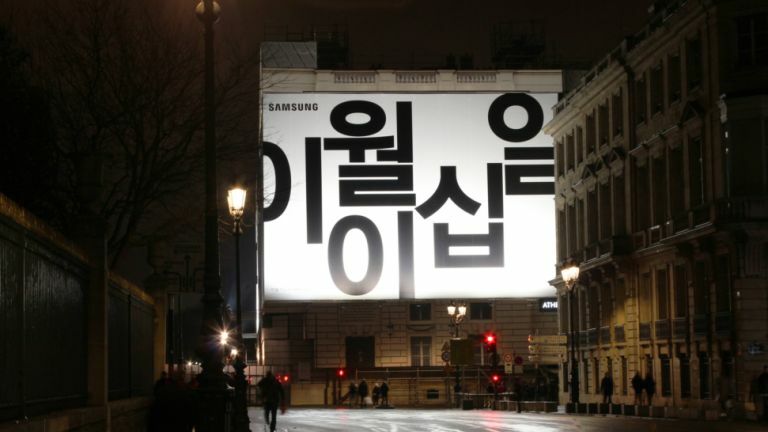 The Seoul-based company has erected a series of billboards along the iconic Place de la Concorde in Paris, France. See what we mean? The Enigma Code, this is certainly not. Samsung has already confirmed plans to hold its next Galaxy Unpacked event, when it typically showcases the next entries into its best-selling Galaxy S and Galaxy Note series, in London and San Francisco on February 20, 2019. The invitation for the exclusive keynote contained the number "10", hinting at the likely launch of the Samsung Galaxy S10 range. Like previous entries in the Galaxy S series, the new handsets are tipped to have an improved edge-to-edge display, camera with adjustable aperture, and the latest Qualcomm Snapdragon silicon. Earlier this month, a monumental Galaxy S10 leak revealed almost every remaining detail about the forthcoming flagship ahead of the announcement next month. Until now, it was unclear whether the hotly-anticipated phone, widely-rumoured to be called either Galaxy X or Galaxy Fold, would make an appearance during the Galaxy S10 announcement keynote. Samsung briefly revealed the foldable screen technology that will power the Galaxy X during its annual developer conference back in November in San Francisco. However, the company disguised the industrial design of the handset with a boxy case to shield it from competitors' prying eyes. The handset also reportedly made a private appearance at CES in Las Vegas during the beginning of January. Galaxy Unpacked will be held one week before the Mobile World Congress (MWC) tradeshow. That's earlier than most tipsters had expected, since the South Korean company has used Mobile World Congress to showcase its latest Galaxy S smartphone in recent years.